Our vast domain knowledge and immense industry experience has enabled us to manufacture, supply and market a wide spectrum of Antidiabetic Hypoglycemic Drugs. These are also available as various combinations for effective treatment of diabetes mellitus. We also manufacture Metformin oral solution for pediatric use. These are produced in our state of the art facilities in accordance with preset standards of the industry and are available at reasonable rates to our clients. Owing to our years of experience, we are capable of trading, supplying and exporting Acarbose Tablets. All the offered drugs are formulated using quality ingredients, procured from the reliable vendors of the market. We also pack all the drugs with the help of our packaging experts, who use quality material to assure complete safety. 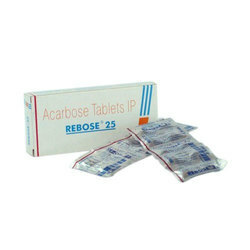 We are one of the leading organizations, engaged in trading, supplying and exporting Acarbose Tablets IP. These drugs are available in different size of packs at most competitive prices to fulfill the needs of several individuals. We also check all the drugs on various parameters, defined by the industry, to ensure zero impurity. 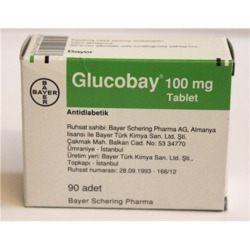 Backed by our efficient workforce, we are capable of trading, supplying and exporting Glucobay 100mg Tablets. These drugs are formulated using quality ingredients and other material to ensure that final output meets with medical industry standards. We also have a team of packaging experts, which uses modern tools and quality material to pack all the drugs. 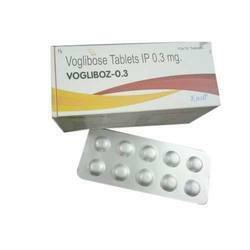 Voglibose Tablets offered works as alpha-glucosidase inhibitor and is prescribed for diabetes mellitus. Coming in tablet for to be taken by mouth with food, it needs to be stored below 30°C. It supports lowering post-prandial blood glucose levels in people suffering from diabetes mellitus. The medicine works by delaying absorption of glucose at intestine level and thus reducing risk of macrovascular complication by preventing sudden surge of glucose post meal.